Mars Needs Moms DVD Review If you can get past this moral high-handedness and the rough edges, it’s really not that bad a movie. 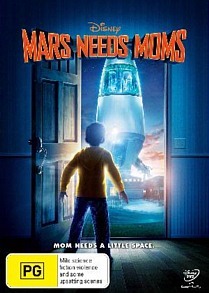 ‘Mars needs Moms.’ With a title like that, I was prepared to hate this movie. I mean, how could this be anything other than one long, cutesy, high-handed sop-fest? Well, I was right and I was wrong. The good news is, I didn’t use the bucket I had on standby once. Milo (played by Seth Green and voiced by Seth Dusky), a nine-year-old boy, earns a grounding from his mother by breaking his promises and lying. Unbeknownst to this typical suburban family, a race of martians is watching their every move with keen interest. Impressed by the stern response and discipline imposed by Milo’s mother, they send a ship to earth and kidnap her in the dead of the night. In a desperate attempt to rescue her, Milo clambers aboard the ship and the two of them are whisked away to Mars. Milo discovers that the surface of the planet is covered in junk, and inhabited by a race of unkempt, dispossessed aliens. He is rescued from their affections by Gribble (Dan Fogler), an adult who has been living on the red planet since he was himself taken as a kid. Combining forces with Gribble and female martian vandal Ki (Elisabeth Harnois), they set out to free Milo’s mum from captivity and save the day. It’s a fairly basic plot, and it never really detours into the unknown or surprises you. The situation isn’t helped by the characters, most of whom don’t seem to have enough to do. Gribble’s robot fills the typical disney role of cheeky animal sidekick, but without an expressive face or any dialogue he lacks personality. The same can be said for Wingnut, Gribble’s ‘other’ sidekick- he just doesn’t make any contribution to the story. While the alien Ki at first appears interesting and charismatic as the female lead, she never develops into anything meaningful, and at the end of the film you’re left wondering if her only purpose was as a love interest for the repressed Gribble. Gribble himself is by far the most interesting character in the movie. While some of his dialogue is cringe-worthy, some of it is genuinely funny, and delivered with boyish enthusiasm by Fogler. While the much-touted motion capture technology is generally used to pretty good effect here, there are some odd moments when a character’s face is meant to convey a particular emotion, and it doesn’t look right. Maybe something has been lost in the translation from the real actor’s face to their animated counterpart, or maybe the performance wasn’t subtle enough in the first place- it’s difficult to tell. But there are some shining lights. The musical score by John Powell is good, with hints of spooky theremin at the beginning, and bold, adventurous tones when the action reaches its peak. The visuals are impressive, in a simple kind of way. And the interplay between the three leads is entertaining for most of the film. There are two special features included on this DVD. ‘Fun with Seth’ shows Seth Green and the other cast members mucking around on set or playing with the mo-cap technology. ‘Martian 101’ deals with the creation of an alien language from the ground up. Even before watching it, you know what the core message of ‘Mars needs Moms’ is going to be - be nice to your mother while you have the chance. If you can get past this moral high-handedness and the rough edges, it’s really not that bad a movie.